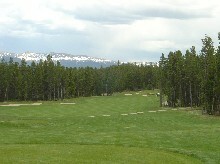 Pole Creek is a 27-hole facility located in between Winter Park and Granby, Colorado. 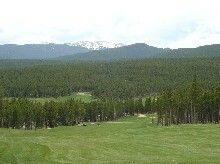 The whole Grand County area has become a year-round destination resort, offering all the obvious winter sports (downhill and cross-country skiing, snowmobiling, ice skating, ...) as well as fair weather activities such as golf, boating, hiking, camping, and the like. 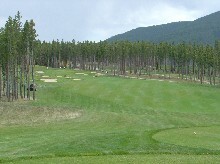 The three nines at Pole Creek each have a distinct character to them, and they can combine with each other to form three 18 hole experiences. As its name suggests, The Ridge nine wraps back and forth over a towering ridge (the first hole up and the last hole down the ridge will take your breath away). 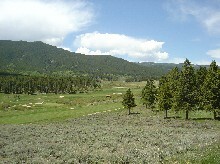 The Meadow course is a bit more benign (with one notable exception), and is nestled along the valley floor. I haven't yet had the pleasure of playing the Ranch, but am looking forward to it. 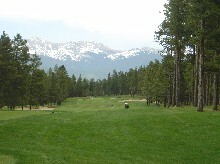 As with most mountain courses, since it's at a fairly high altitude, you tend to get an extra club's worth of carry compared to the Front Range, and maybe even two compared to sea level. 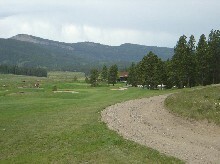 Unlike nearby Grand Elk, this course tends to be carved out of the forest. Even on open holes along the valley floor, the woods are never far away. 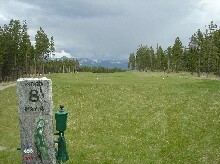 Carts here did not have GPS (as of summer 2004), but the course is pretty well marked for yardages. There are some eye-popping mansions tucked in amongst the trees, most of which appear to be vacation homes. (Makes you wonder what their main residences might look like...). The bucolic forest setting, and the occasional deer wandering through the trees leave you with a sense of peace which belies the inherent challenge here. Ridge #1 – This hole is a brute -- no other way to put it. At 446 yards, it's long enough already. But it's also uphill all the way. If you get lucky and really crush your drive (unlikley on the first hole...), you're still going to be playing a 200 yard shot that plays more like 230. Nobody likes to feel good about getting a double, but on this hole, it's not that bad a score (don't worry, you can make it back on #9). Anyway -- the strategy here is to do what the scorecard suggests, and make your way over to the right side of the fairway (no mean feat since the hole takes a sharp dogleg left. Trying to cut the corner just brings the corner of the woods into play, not to mention an interesting complex of bunkers next to the green. Ridge #2 is a relatively benign par 3. The green is long and narrow, and guarded on the sides by bunkers. So being pin high, but off to the side is a bad approach, because you have to chip over a bunker, and then hold the green without rolling into the bunker on the other side. Playing for a shorter shot and chipping on from in front is a better strategy. Ridge #3 is another uphill par 4. For some reason, this doesn't seem as back-breaking as number one. It's not quite as long, and certainly not as steep. But it's still a significant hole. The fairway is pretty wide, so go ahead and use the driver if the mood takes you. 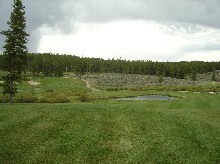 Ridge #5 is a par 3 which wraps around a pond on the left. So your bailout is to the right. The hole actually sets up pretty well for "fraidy cats" like myself. There's a huge bank to the right of the green that will usually keep overly cautious shots from bounding into the woods. If you can keep your knees from knocking together long enough to admire the view, it's really a pretty hole. Ridge #6 is a par 5 with a gradual uphill slope. As you can see from the picture, there's an interesting complex of bunkers on the left as you make your approach shots into the green. The hole doglegs around the trees to the right, but those trees are also the reason why you don't want to cut the corner too close. The Bogey Golfer recommends aiming at those bunkers on the left off the tee, and then navigating past them with short irons. If it takes you four shots to reach the green with that strategy, so be it. Ernie Els we're not. Ridge #7 is a tantalizingly short par 4. From the white tees, it's only 307 yards, and somebody in your group is going to go for it. Make sure that the green is clear before you do -- after all, you might actually make it! Obviously, the smart play is play a couple of irons -- this gives you a chance to a) avoid all the sand traps up the left side of the fairway, and b) make sure you don't hit through the fairway into the woods on the right (the hole has a slight dogleg left). Ridge #8 is a very challenging, long, uphill par 4. At 456 yards, it's actually longer than the opening hole I was whining about, but the hill isn't nearly as steep. 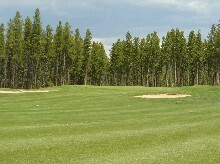 Stay to the left off the tee for the better angle into the green (traps guarding the right hand side). Use an extra club going up the hill. Ridge #9 -- If you're a hunter, you know what "buck fever" is. If you're not, it's a feeling of excitement that is so intense that when you get the perfect chance at that 10-point buck, you can't make the shot. #9 is like that. It's a par 5 that goes down a hill so steep that you feel like you can just jump off the tee box and land on the green. You will feel an overpowering urge to haul out your driver and hit it just as hard as you can. Do it! Only take three deep breaths, and slow your swing down. If you hit the sweet spot, that ball will hang in the air forever. It still won't reach the green, but it will give you a thrill. Heck, I hit mine into the woods on the right and even that was fun. Pay attention to the green when you get there. It's pretty steep up the hill from front to back. Meadow #1 is a pretty straightforward, short hole. It's only 333 yards from the white tees. It goes down a little hill, and then up the other side. Hit something straight, stay out of trouble, and there's a chance to make par here. 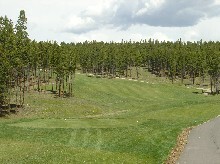 Meadow #2 is a short (509 yards) par 5. It's narrow, and there's trouble to be had on both sides of the fairway (sand traps, forest, ...). So hit the ball straight and keep it in play. The bunkers are especially fierce up around the green, so you might want to lay up on your final approach shot. Meadow #3 is another short par 4 (321 yards) laden with interesting obstacles. The day I played there, the most interesting obstacle was a sudden rain squall that appeared out of nowhere, complete with a 40 mph headwind. This forced me to hit a driver off the tee, when I ordinarily would have hit about a six iron. After the wind knocked my tee shot down (actually the wind got inside my head, and I knocked the tee shot down myself), the squall moved on, and things got back to normal. Anyway, there are strategically placed fairway bunkers both right and left, and a bunker on the front right of the green. So hit something straight between the fairway bunkers, then hit your approach shot short and left. This opens up the whole green (very long, very narrow) to a bump and run chip shot. Meadow #4 is a great par 3. Your tee shot carries over the pond on the left, onto a green surrounded by burms. If you're going to miss, go long and right. Because of the burms, you can afford to go straight at the pin if you're confident you can get the ball up into the air. Meadow #5 is a strategy hole with a split fairway. 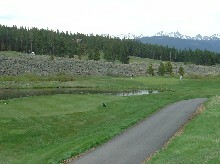 A creek (and associated natural area) divides the fairway longitudanally. You can cut off some of the distance by taking the right-hand route. But (and this is a BIG but), your second shot into the green will be all carry. Pretty intimidating. Much safer to take the left-hand route, always assuming your tee shot clears the creek. Meadow #6 is a relatively benign par 3, according to the scorecard. From the white tees, it's only 168 yards. The important (and subtle) thing about this hole is that it is uphill. For some reason, I overlooked this fact and landed a full twenty yards short, even with a pretty good hit. Take a second look at the yardage, the hill, and the wind, and make sure you have plenty of club. Those traps in the front are no fun! 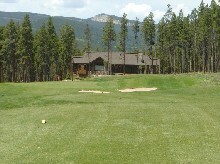 Meadow #7 -- This hole is a piece of work! I dub it "The Par 5 From Hell". Some par 5's occasionally tease you with birdie chances, if you can hit two decent shots back to back, and then get up and down from around 50 yards. Not this one. This has two (count them, two) chasms to cross -- unless you're Tiger Woods and can cross them both with one mighty blow. I donated three or four balls trying (no, I didn't use any Pro V1s). You need a good strong tee shot that will get you 230-250 yards. Then you need an iron shot with pinpoint accuracy to hit the landing pad in between the two chasms. Then you need a smartly struck short iron back up the hill to the green. Well, that's the way the par shooters play it. Us bogey golfers have to be prepared to lay up on the second shot since we probably aren't going to get that perfect 230-250 yard tee shot. The heck of it is, the layup is touchy. You're laying up in front of a chasm that's at the bottom of a pretty steep hill. So if you land on the downslope, the kick might well propel you into the chasm. And if your layup leaves you at the top of the hill, well, now you're trying to play that par-shooter shot onto that landing pad I was muttering about. My advice is: Hit the best tee shot you can. Try to hit your second shot into the hazard (maybe you'll get lucky and be short). Take your penalty drop at the edge of the hazard at the bottom of the hill, and try to hit a long iron or a five wood across both chasms, and get as close to the green as you can. Then pray for an up and down. Two in, three out, four across, chip on -- one putt for bogey, two for double. Take it and move on! Meadow #8 -- If you're like me, #7 will still be rattling around in your head while you're on the tee, and you'll be wanting to "get even". Don't. Put the driver away, and get a seven iron. Hit three shots straight so you can get to feeling sane again. 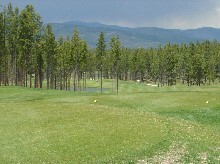 Meadow #9 -- From the white tees, the last hole is 387 yards. Both 8 and 9 play along a ledge on the left -- so don't tempt your luck over there. Of course the woods go up the hill to your right, so that's no picnic either, but a least the ball wants to feed away from them. Play conservatively -- hit your three wood or even a mid-iron. The approach shot into this green is a little bit downhill, and the best way to come in is with a high shot -- a bump and run might keep running.